I wrote "Back to fantasy for the three-day weekend" at the end of Ambassador Pete Hoekstra denies Islamophobic comments, calling them 'fake news', and I meant it. 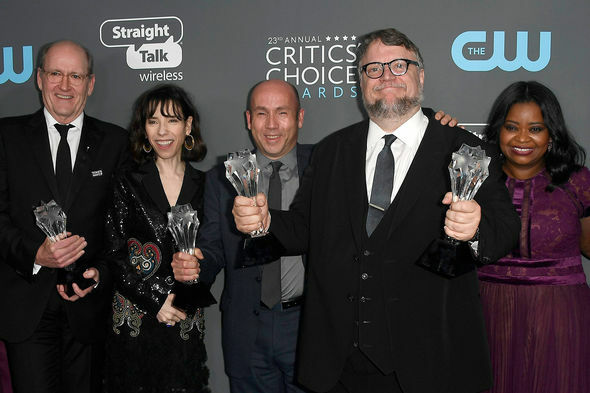 In fact, I have quite the entertainment agenda for today through Monday, beginning with revisiting my predictions in 'The Shape of Water' leads speculative fiction at the 2018 Critics' Choice Movie Awards and comparing them to the winners. I begin with what I wrote above the jump for "The Shape of Water." Deadline lists all of them, which I've re-ordered to suit my priorities: Best Picture, Best Sci-Fi or Horror Movie, Best Actress for Sally Hawkins, Best Supporting Actor for Richard Jenkins, Best Supporting Actress for Octavia Spencer, Best Director for Guillermo del Toro, Best Original Screenplay for Guillermo del Toro and Vanessa Taylor, Best Cinematography for Dan Laustsen, Best Production Design for Paul Denham Austerberry, Shane Vieau, and Jeff Melvin, Best Editing for Sidney Wolinsky, Best Costume Design for Luis Sequeira, Best Hair and Makeup, Best Visual Effects, and Best Score for Alexandre Desplat. Wow! Not only do these 14 nominations lead speculative fiction films, they lead all films nominated. At least one of my predictions didn't come true and another has yet to be tested. I had thought either "Beauty and the Beast" or "Pirates of the Caribbean" to be the best fantasy film of 2017. No longer. I now think "The Shape of Water" will be the favorite in that category at the Saturn Awards and in Best Sci-Fi or Horror Movie here in the Critics' Choice Awards. "The Shape of Water" may have won Best Picture, but it didn't win Best Sci-Fi or Horror Movie. I'll examine that paradox over the jump. Now for the rest of my predictions. The second most nominated speculative fiction film earned only one statuette, Best Cinematography for Roger Deakins. At least it won something. Most of the second most nominated films overall, "Dunkirk," "Lady Bird," and "The Post," did not win a single award and "Call Me By Your Name" earned just one. Now for the prediction about "The Shape of Water" that I mentioned above that didn't come true. I was right and wrong. Watch 'Get Out' Takes Home 2 Critics' Choice Awards from Wochit Entertainment to see the results. "Get Out" received two awards at the 2018 Critics' Choice Awards Thursday night. Written and directed by Jordan Peele, the genre-bending comedy-horror film won the awards for Best Original Screenplay and Best Sci-Fi or Horror Movie. The film beat out "Blade Runner 2049," "It," and "The Shape of Water." Lead actor Daniel Kaluuya was nominated for Best Actor but lost to Gary Oldman for "The Darkest Hour." So "Get Out" won Best Original Screenplay, as I predicted, but it also beat "The Shape of Water" for Best Sci-Fi or Horror Movie. I thought that was strange. So did one commenter at the Entertainment Weekly report, observing "Interesting how "Get Out" beat "The Shape of Water" for Best Horror/Sci-Fi, but "Shape of Water" one for Best Picture. How does that work?" Yeah, how does that work? Another commenter responded with an answer that made sense, writing "Most simple explanation is that with the greater candidate pool, more Get Out voters selected a film from a category other than Horror/Sci-Fi for their Best Picture than did Shape of Water voters." I can see how that would work. Not only do electorates matter, so do the choices available and voting systems used. Now I wonder if the Broadcast Film Critics Association uses first past the post or ranked choice for the Critics' Choice Film Awards and if those would have produced different results. By the way, I was not surprised that Gary Oldman won. As I wrote, "Out of this slate, I'd vote for Gary Oldman. There is nothing like a good Winston Churchill." I was right to be ambivalent, as it won no awards. Three superhero films tie for fifth with three nominations, "Logan," "Thor: Ragnarok," and "Wonder Woman," all of which are nominated for Best Action Movie. The critics think "Logan" has better acting with Patrick Stewart nominated for Best Supporting Actor and Dafne Keen for Best Young Actor/Actress. I expect both will be nominated in the equivalent categories at the Saturn Awards. In contrast, "Wonder Woman" has better technical achievement, being nominated for Best Costume Design and Best Visual Effects. "Thor: Ragnarok" has both good acting and technical achievement with Chris Helmsworth earning a surprising nomination for Best Actor in a Comedy (I guess he's that funny) and the film competing with "Blade Runner 2049," "The Shape of Water," "Wonder Woman," "War for the Planet of the Apes," and "Dunkirk" for Best Visual Effects. I'm not confident about any prediction for that field! On the other hand, if I'm confident about any prediction of mine, it's that "Wonder Woman" is the favorite to win Best Action Movie. It's also among my two favorites to win Best Comic-Book-to-Film Adaptation or its equivalent at the Saturn Awards. Like I was right to be ambivalent about "Beauty and the Beast," I was right to be confident about "Wonder Woman" winning Best Action Movie. 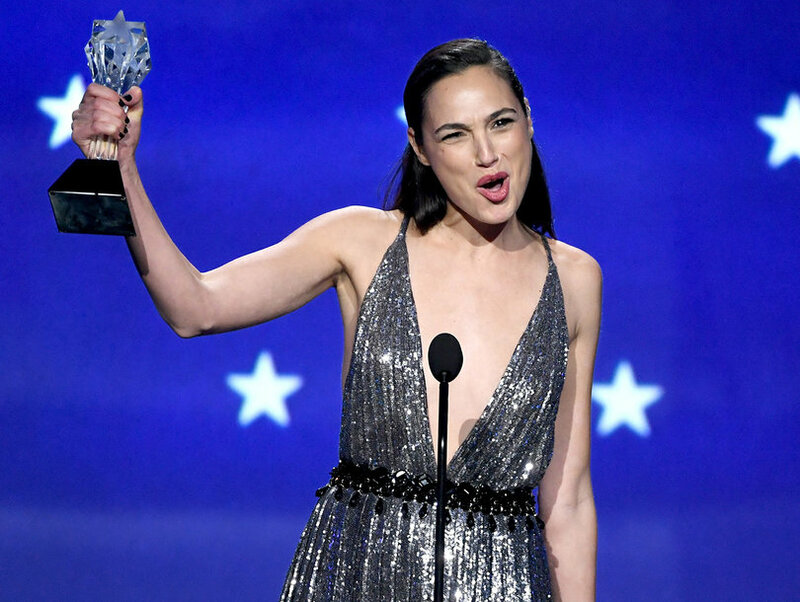 What I didn't anticipate was Gal Gadot winning the See Her Award, which Wochit News reported in 'Wonder Woman' Wins At 2018 Critics' Choice Awards. Watch this clip from Demi Lovato News to see and hear Gal Gadot Receives The #SeeHer Award - 2018 Critics’ Choice Awards. Gadot gave a wonderful acceptance speech. In a way, "Wonder Woman" won two awards, tying it with "Get Out" and placing it ahead of "Blade Runner 2049." As for the Saturn Awards prediction, it will take until June to see if that prognostication comes true. "War for the Planet of the Apes" earned two nominations, Best Action Film and Best Visual Effects. I think the first is misplaced (it should be the fifth nominee for Best Sci-Fi or Horror Film), while the second shows the strength of screen capture and CGI to portray its ape characters. It won Best Visual Effects. Now to see how it fares against "Star Wars: The Last Jedi" at awards shows where the latter is eligible. The other speculative fiction film to garner two nominations is the Disney/Pixar film "Coco" for Best Animated Film and Best Song for "Remember Me." I think it might win Best Animated Film. I'm not as confident that it will win Best Song against "Stand Up for Something" from "Marshall" by Common and Diane Warren. As I predicted, "Coco" won Best Animated Film. "Remember Me" managed to beat my expectations by also winning Best Song, beating both "Stand Up for Something" and “This Is Me” from "The Greatest Showman," which won the Golden Globe. That was a pleasant surprise for speculative fiction, putting it in a tie with both "Get Out" and "Wonder Woman" and ahead of both "Blade Runner 2049" and "War for the Planet of the Apes." Adding up all the awards earned by speculative fiction films yields twelve. That's better than last year, when 'Deadpool' won three awards, 'Arrival' earned two, and Margot Robbie won Best Actress in an Action Movie for her role as Harley Quinn in "Suicide Squad," "The Jungle Book" won for Best Special Effects, and "Zootopia" won for Best Animated Feature, for a total of eight. I won't complain about a 50% increase in speculative fiction wins. In fact, I'll call it a very good year for science fiction, fantasy, and horror. I'm not done with the Critics' Choice Awards. Stay tuned for the television winners as the Sunday Entertainment feature. *Here are the predictions I made about "Three Billboards Outside Ebbing, Missouri" and other non-speculative fiction winners. Best Actress: "Meryl Streep has the name, Frances McDormand has the performance, and Jessica Chastain and Margot Robbie have the stories. It should go to McDormand, but Streep might pull it off." It went to McDormand, both here and at the Golden Globes. Best Supporting Actor: "I hear the acting in 'Call Me by Your Name' is excellent and I'd favor Armie Hammer over his co-star. Still, they might split their vote so Willem Dafoe or Sam Rockwell wins instead." Rockwell won the award both here and the Golden Globes. Best Young Actor/Actress: "Jacob Tremblay is my pick, even if I think they're all wonderful. If it were split between actors and actresses, I'd say Brooklynn Prince would get the young actress win." Prince won, so I was half right. At the Saturn Awards, Dafne Keen from "Logan" will likely be my favorite, depending on the field. Best Actor in a Comedy: "I think Carell is the favorite, but Nanjiani might pull this one out, as 'The Big Sick' is a smart comedy about a tragic subject." Neither won. Instead, the trophy went to James Franco for "The Disaster Artist," who also won this award at the Golden Globes Hollywood, including the entertainment press, loves good movies about itself and "The Disaster Artist" qualifies. Best Editing: "I'm rooting for the science fiction movies, but I expect 'Dunkirk' might win." Much to my pleasant surprise, "Baby Driver" won. Best Costume Design: "Four of the five nominees are speculative fiction, so genre films are doing well in this category. Out of all of them, I'd root for 'Wonder Woman' or 'Beauty and the Beast.' However, 'Phantom Thread' is about fashion, so it might just pull this one out." It did, so I'll claim that I called it. Best Hair and Makeup: "I think 'Wonder' might win just on the strength of its prosthetics. However, I think either 'Beauty and the Beast' or 'I, Tonya' have better hair." Nope. It went to "Darkest Hour" for turning Gary Oldman into Winston Churchill. Best Foreign Film: "'Thelma' is the speculative fiction movie, but 'PBM' has the positive message and 'The Square' has Elizabeth Moss. That written, I have no idea." "In the Fade" won. I really did have no idea.